Getinge’s Maquet PowerLED II Surgical Light brings best in class technology to general and Hybrid OR’s by improving surgical efficiency for surgeons and staff. The best-in-class Maquet PowerLED II Surgical Light brings clear, shadow-free illumination to the general or Hybrid operating room, improving tissue visualization for better clinical outcomes. 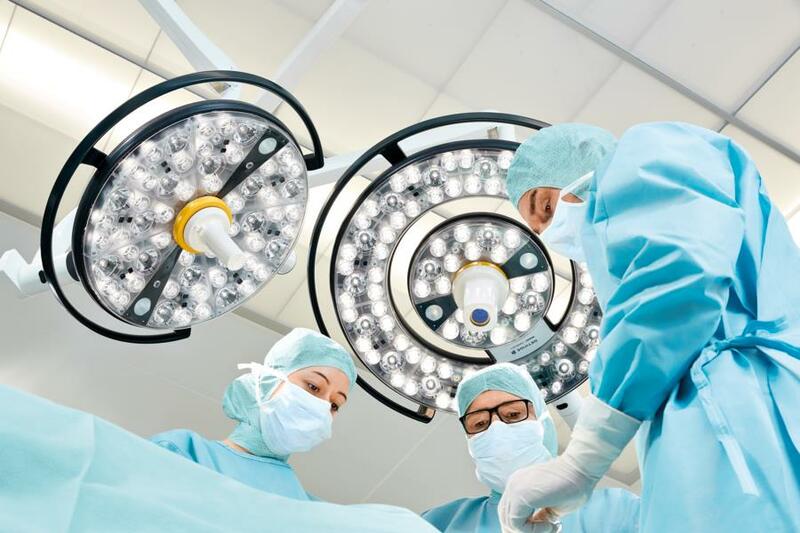 The Maquet PowerLED II Surgical Light is the evolution of the proven Maquet PowerLED technology which has been used in in operating rooms for more than a decade. Important new features include laser aiming guidance for precise positioning, an adjustable light patch size to direct light where it’s needed most, and a Comfort Light option to reduce contrast between the bright surgical patch and surrounding area, helping increase surgeon visual acuity while reducing visual fatigue. Other innovative technologies include Automated Illumination Management (AIM) that automatically increases light output when the light path is partially obstructed by staff, an optional Luminance Management Device (LMD) that prevents excessive variations in luminance output helping reduce surgeon eye fatigue, and an anti-bacterial coating on all high touch surfaces to help prevent cross-contamination and hospital acquired infections. The Maquet PowerLED II Surgical Light also addresses important Cost of Ownership considerations in several ways. It is compatible with Getinge’s Maquet SATELITE Ceiling Mounting System which allows equipment to be easily added, removed or upgraded to meet future requirements using three axis mounting points to attach lights, monitors, the Orchid FHD camera and X-ray shields. The LEDs used in PowerLED II provide for a full 60,000 hours of reliable light output with no shifts in the optical parameters over time. Upgrading from PowerLED saves on installation costs due to the fact that the new PowerLED II uses the same ceiling mounting components as the previous generation product. This product is currently available for sale in the US. Click HERE to learn more about the Maquet PowerLED II Surgical Light, and visit our website at www.getinge.com to view our entire product offering. Getinge is a global provider of innovative solutions for operating rooms, intensive-care units, sterilization departments and for life science companies and institutions. Based on our first-hand experience and close partnerships with clinical experts, healthcare professionals and medtech specialists, we are improving the everyday life for people, today and tomorrow.